Yu Yuphoria : Best affordable Smartphone 2015 period ! In a country like India the major smartphone contender has been micromax, truly speaking they have literally given affordable handsets into the hands of many without burning a hole in their pockets. Micromax has been good with its Smartphone department but the part where they lack is software ! Fun Fact : " If you have a brand new motorcycle it just might work fine for six months or even a year or so.. But if you need it to be running smoothly and sufficiently you'll have to throw it back for servicing ". Same goes with the Smartphone or any other gadgets, Of-course it's good to have some decent specifications loaded on, but if you ain't getting any software updates you might actually move on and just buy something fresh..! Well to overcome this Micromax introduced entirely newer separate company by the name " Yu televentures " and not a while ago did they unveil their first device : YU Yureka ! These Yu branded phones have something in common and that's : CyanogenMod . Yesterday,12th May,2015 at the company's latest event they introduced their latest Affordable YU branded smartphone : YU Yuphoria . Great thing about this device is that it's the first to be designed and made in India. Yuphoria gets it's name from a recent contest run by YU community #younameit. So the first thing that comes to your mind must be, Is it a successor to Yureka ? Well kind off yeah, but hey actually not. This device ain't a specs monster like Yureka. In turn its an affordable offering by the company. It comes in gorgeous metallic brushed band properly spaced for antenna reception with the rear end tossing up with plastic removable back cover. The device made, is in close resemblance with Nokia's Lumia 830 offering. It is available in 2 colours : Buffed Steel and Champagne Gold, Again tossing up on the colours from its competition "Apple". It comes with a 5 inch IPS screen (1280x720) with 294ppi & protecting is the already famous : Gorilla glass 3, It comes with a 64bit arch, 1.2Ghz Quadcore Snapdragon 410 chipset (Arm cortex A53) along with adreno 306 GPU clocked at 400Mhz coupled with 2GB Ram, has 16GB internal memory with expansion upto 64GB via Micro:SD card, It is a dual sim device both sim's supporting LTE (4G) antenna bands, has a AF 8mp rear camera with f2.2 lens capable of recording 1080p videos @30fps and 720p videos @60fps with LED flash and a front 5mp selfie camera with a larger f2.0 lens, last but not the least, it's 2230mah battery ,YU has also has a surprise over here since Yuphoria will be the first affordable phone supporting fast charging, as you will get upto 0-65% in less than 45mins. All of that dycing and slicing up with Cyanogenmod 12 running on top of Android 5.0.2 on Yuphoria. The main name of the game making this handset, future proof !. Audio output improvements have also been done with pure wolfson sound and audio fx. And the best part all ,it only costs you just Rs.6,999(INR) !! honestly that's mind boggling! If you are off to buy a new affordable phone this definitely might be right choice. So is it any better than Yureka ? Definitely not ! To better understand it Yureka has a Octacore chipset on board rather than the usual Quadcore chipset of Yuphoria's. 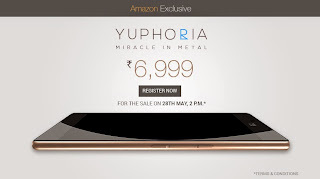 Yuphoria will be available on Amazon starting this 28th May at 2pm via flash sales ! You gotta be quick if need that bang in your pocket ! Well is this the incarnation of affordable market ? Is it the answer to Google's Android One or Xiaomi'S redmi's or Motorola's E's ? Well only time will let us know, even though i am quite sceptical and waiting for 2nd Batch of Android one devices ! Also see : What's going to happen at Google IO 2015 ?